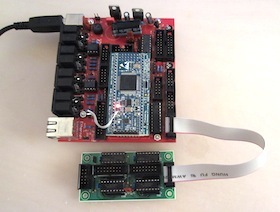 The MBHP_DIO_MATRIX module has been initially be designed for the MIDIO128 and MIDIbox KB project to simplify connections to keyboard matrices. 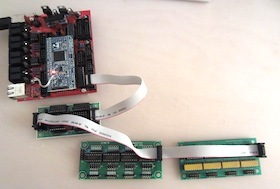 It's compatible to the MBHP_DIN and MBHP_DOUT module, which means that it's for example possible to use it as a replacement when only two DIN and two DOUT shift registers are needed for a project, or when the special pinout of the digital in- and output pins lead to a better wiring to the frontpanel. The digital input part consists of two 74HC165 based serial shift registers; every register provides 8 digital inputs which are sampled with the latch enable signal LD, and shifted out with the clock signal SCLK. The digital output part consists of two 74HC595 based serial shift registers; every register provides 8 digital outputs which are updated with the latch enable signal RCLK, and shifted out with the clock signal SCLK. The advantage of using such shift registers is, that they can be cascaded to a long chain without the need of more than 6 cables to the core module. This means that multiple MBHP_DIO_MATRIX modules can be connected in order to enhance the number of inputs and outputs. Normaly up to 16 DIN and up to 16 DOUT shift registers are supported by MIOS or MIOS32 based applications, MIDIbox NG even allows to connect up to 32 DIN and 32 DOUT registers in a chain! By connecting multiple buttons to a matrix, it's possible to scan multiple rows as shown in this schematic. It's even possible to connect buttons (or encoders) and LEDs directly to the MBHP_DIO_MATRIX module as shown in this schematic. J1 10 Interface to CORE:J8/J9. DINX4:J1 provides two power pins for 5V/Ground, the serial clock, the latch enable and the serial input and output of the register chain. 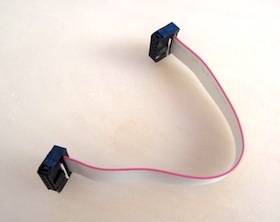 This port can also be connected with J2 of another DIO_MATRIX, DIN or DOUT module. 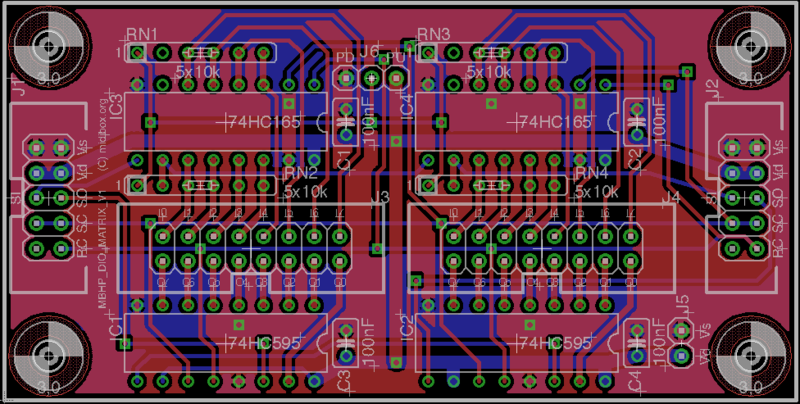 J2 10 Interface to another DIO_MATRIX, DIN or DOUT module. DINX4:J2 provides nearly the same pins like J1, just only the serial in- and output of the last shift register is connected instead of the out- and input of the first one to realize a cascaded serial chain. J3 and J4 16 8 digital inputs (I0..I7) and 8 digital outputs (O7..O0). 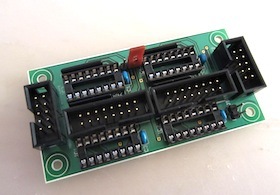 Note that the outputs are reversed; all firmwares take care for this, means: with the first (leftmost) input pin is usually connected to I0, the first (leftmost) output pin is connected to O7. J5 2 Provides a +5V (=Vd) and ground (=Vs) output. J6 3 A jumper has to be connected to this port to select pull-up or pull-down behaviour for the digital inputs. For most projects the pull-up behaviour should be selected! The pull-down behaviour might be required for adaption to existing keyboard matrices with reversed diodes. Attention: take care for the polarity! The dot on the resistor network marks pin 1! Thereafter mount the connectors J1..J6. You could already stuff the pull selection jumper at J6, because it's essential! For "normal" projects the Pull-Up option has to be selected. Please note that it's intended that the cable is somehow twisted by 180 degree!